Good afternoon everyone. Welcome to our 8th grade graduation. 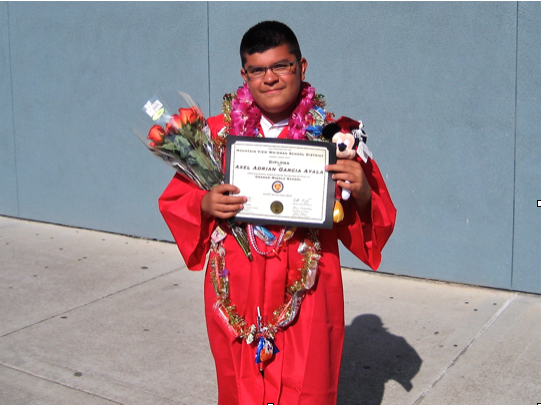 I am Axel Garcia and I am a turnaround student, I have learned two things at Graham; believe in yourself and never give up. When I started sixth grade, I was a goofball. I always talked in class and I never asked for help when I had a problem, and also didn’t do my homework on a regular basis. I never thought of my future and the result of this was that I was a C student. This bothered my mom a lot but for me, I was bothered only for a few days. Then, in 7th grade I was doing a little bit better, but I didn’t think of my future. When I think back, I think of a person that influenced me. This person was Mr.Sayer, who was my social studies teacher. One day, Mr.Sayer gave us a big project about Ancient China. I needed to do a video of the Tang Dynasty. I didn’t know what to do because I was goofing off. I realized I needed help, so I went to him at lunch and asked him to help me. He sat down with me and showed me an example and he encouraged me to complete my work. It made me feel respected and that I could accomplish hard work. By the end of 7th grade I slowly started to realize school was more important than I thought. Finally, I started 8th grade. I am now a hardworking student who is confident in my work. Also, I learned how to ask for help when I need it, which has help me to accomplish my goals. Now, I’m in College Bound, which is a class for students whose parents have not been to college. We learn a lot of facts about college and we learn what we do when we leave college. One day in my class, I heard about 3 scientists that would come in my class. They all had 8 years of college and they were physics majors. I thought they would be strict and formal. But they were funny and enjoyable people even though I didn’t understand a lot of things they were saying. I met a wonderful person named Dr. Winkleby who is a professor in Stanford Medicine. She tutors me in language arts every week. She always tells me I will go to college. Now, I’m an 8th grade graduate, I’m almost an A student. Next year I look forward to going to Los Altos High School and join AVID, which is a program to help students to go to college. One phrase that I would sum up my three years of Graham is reaching the top of the mountain. One inspirational leader that climbed up the mountain was Cesar Chavez. He said, “There’s no turning back. We will win. We are winning because ours is a revolution of mind and heart”. Before I leave, I want to thank a few teachers and staff that have believed in me and inspired me. They are Mr.Katz, Mrs.Dorocak, Ms.Delaney, Ms.Lo, Joey, Ms.Thompson, Mr.Chesley, Ms.Jan and Ms. Standley. I really want to thank one person that is always been a role model for me and that is my Mom.